It's summer! Time to head to the pool and the beach—with a bajillion other people. 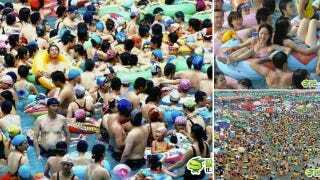 Here is a sample of what are apparently swimming spots in China. There doesn't look like there's much swimming going on. The images are a bit like looking at Pointillism paintings or video game sprites. If these photos amaze you, you are not alone. Online in China, the reaction has also been one of surprise—ranging from "Oh my god" and "Woah" to "Yep, that's China for ya (lulz)."